The FABTECH SmartForce robotic cell will feature 3M™ Cubitron™ II Fibre Disc 982C, which is well-suited for edge chamfering, beveling, and removing carbon steel welds, mill scale, pits and imperfections, and machining grooves as well as the Scotch-Brite™ Light Grinding and Blending Disc, which achieves a high cut-rate for optimal weld grinding and blending in mild-steel applications. On Saturday, January 21, 2018, ABCO Automation hosted a follow-up open-shop build day at its Greensboro, N.C. facility for area FIRST Robotics Competition teams. In the spirit of “Coopertition,” members of the multi-team “Triad Alliance” returned to ABCO two weeks into their six-week build cycle, collaborating on design concepts and manufacturing components. The event was planned by Brian Page, coach of FRC team “Triple Strange.” After a brief company introduction and safety overview by Dwight Marcellus, director of operations, ABCO Automation, team members, coaches, mentors, and parents, spent the morning working out design details, programming, and preparing part drawings. ABCO engineering and manufacturing staff were on hand to support the teams, fielding technical questions and spending time talking with students about various career opportunities with an automation company like ABCO. After a quick break for lunch, the flurry of activity continued with parts being routed through manufacturing, more design work, and programming. The teams have just four weeks remaining in the 2018 FRC season to complete and ship their robots to the FRC competition. ABCO has been a proud supporter of US FIRST Robotics for many years. Our highly skilled engineering and technical staff volunteers and our in-house manufacturing capability make us uniquely qualified to support FIRST and encourage students to pursue STEM education and careers. For additional information visit: www.firstinspires.org. ABCO Automation, Inc., announces the availability of Stingray, a robust, low-profile modular belt conveyor that employs micropitch plastic belts. Just as its name suggests, Stingray is powerful, yet gentle. This heavy-duty stainless-steel conveyor provides extremely reliable product transfer, smooth transitions, and product accumulation, making it ideal for delicate, small footprint, or unstable products that may be damaged by a conventional conveyor. Stingray conveyors are pre-engineered, built to order, and available on a quick-ship basis from ABCO’s Build-to-Print group. On January 7, 2018, ABCO Automation hosted a "Coopertition Event" to help jump start the 2018 FIRST Robotics Competition for area robotics teams. More than 80 students, coaches, mentors, and parents representing six local teams attended the event at ABCO's facility in Greensboro, NC. The event was planned by Brian Page, coach of Triple Strange. In addition, the HotBotz, Team Apollo, and Girls on Fire teams were well represented. Brad Kemmerer, president and CEO ABCO Automation, welcomed the group and presented a brief overview of ABCO Automation and a review of the engineering design process. Ernie Collett, manufacturing manager ABCO Automation, discussed how designs are turned into parts via drawings, models, cutting, machining, and welding. Attendees were given a tour of ABCO's manufacturing areas before getting to work. The teams reviewed the 2018 "Power Up" rules and worked on strategies to play the game. The teams have just six weeks from January 6th to ship their robots to their FIRST competition. The teams will return to ABCO on January 20th for help with prototyping concepts, making parts, designing, and programming. US FIRST Robotics is a great way to encourage students to pursue STEM education and careers. With ABCO's technical skill base and engineering personnel, ABCO is uniquely qualified to support FIRST. For additional information visit: www.firstinspires.org. In conjunction with the Reidsville, NC Salvation Army, ABCO once again committed to support the Angel Tree Program. According to Tina Peterson, payroll and benefits coordinator, ABCO Automation, “Last year we had great success with the Angel Tree Program, so we decided to expand our efforts and support eight families this year. And, our employees stepped up, so we could meet our promise. By combining cash donations with employee-purchased items, we presented the Salvation Army with a variety of clothes, toys, games, personal care items, puzzles, sports equipment . . .” The Salvation Army has been running the Angel Tree Program for nearly 40 years and has provided Christmas presents to millions of children and families in need. ABCO Automation hosted a Guilford Apprenticeship Partners (GAP) open house at its facility on November 30, 2017. ABCO had nearly 70 attendees, including 18 students plus family members, Lydia Craddock, transitional career counselor, Rockingham County Schools, and Dr. Kenneth Scott, director of classified personnel/career and technical education, Rockingham County Schools. Brad Kemmerer, CEO and president, ABCO Automation provided a welcome and company overview, and Ernie Collett, ABCO’s manufacturing manager, provided an overview of the GAP program and introduced Jacob Mohan, GAP fabrication apprentice. In addition to the presentations, several ABCO employees provided tours of the ABCO facility, including its machining/fabrication center and two main project assembly and test buildings. ABCO Automation is a charter member of Guilford Apprenticeship Partners. As part of the alliance, ABCO provides apprentice positions for local high school students. For everyone it’s a win-win—ABCO supplements its current manufacturing team, and the students are paid for gaining on the job experience while earning a college education. 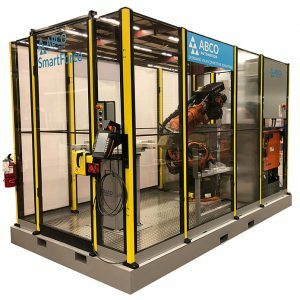 ABCO Automation, designer and builder of high-end factory automation systems, announces the signing of a Value-Added Reseller (VAR) agreement with Visual Components, a global leader of 3D manufacturing factory simulation software. With this agreement, ABCO adds Visual Components simulation software to its service offerings. The software extends ABCO’s current service portfolio, which includes field support, on-site installation, laser safety, system training, project management, and engineering. Visual Components combines three engineering disciplines in one platform, including material flow, robotics simulation, and controls validation. With Visual Components 4.0, users design factory layouts with numerous models and factory components, such as pre-engineered conveyor units and industrial robots. Through the software’s visualization, users get an approximate graphical view of a factory or production line, while the simulation function creates an accurate version of the factory or production line with all the components operating in a real environment. North Carolina schools and manufacturers work together to prepare the skilled workforce of the future. At the TEDx San Diego event on October 14, Dr. Mary Walshok, associate vice chancellor for Public Programs and dean of Extension at the University of California, San Diego, gave a short talk in which she said we need to add HEART to STEM. She coined the acronym HEART meaning Hands-on, Engaged, Applied, Relevant Training whereas STEM means Science, Technology, Engineering & Math. She said too many educators don’t realize the need for hands-on workers such as machinists, welders, plumbers and electricians. Too many parents are focused on their children getting a college education, which is why we have millions of unfilled jobs requiring hands-on training. She recommended combining HEART and STEM to be more competitive as a country in the global economy. Fortunately, there are more and more cities, regions, and states that have awakened to this problem and are doing something about it. Charleston, S.C. and the Piedmont Triad region of North Carolina are among the problem-solving regions. After visiting the Guilford Technical Community College aviation training center, my hosts took me to visit one of the companies involved in the apprenticeship program, Machine Specialties Inc., where we met with Rob and Tammy Simmons, president and executive vice president of the company. Rob Simmons said, “The company was founded by Carlos Black in 1969 after he moved to the U.S. from Argentina where he had apprenticed as a machinist. I started in 1980, and we were primarily a small machine shop supporting the textile industry. In 1990, we expanded into screw machine parts. We got our first government contract in 1995. I became part owner in 1998, and we moved into a new building in 2003. We expanded into doing large parts like aircraft landing gear and added in-house anodizing and chem film. We bought this building in 2009 with all of the office equipment. We added a large laser cutting machine in 2009, and now have two lasers. Then, we bought two large multi-axis WFL machines to be able to machine titanium. We are open 24/7, but our weekend shift works three days. We are AS9100 certified for aerospace, ISO 9001 for commercial, and ISO 13485 for medical parts. Tammy Simmons said, “We were one of the first six companies to work with Guilford County Schools in starting a new apprenticeship program in the fall of 2016 for those interested in the advanced manufacturing field. Students will undergo a 3-4 year program where they can receive an associate’s degree in Manufacturing Technology, a journeymen certificate as a machinist or welder, have their school paid for, and then end up with a manufacturing job. “About 50 students, juniors and seniors, applied for the program, and 27 students were selected to start the program initially. This year we are up to 20 companies participating in the apprenticeship program. During the summer, the students took classes for six weeks and then worked full-time for six weeks. Afterward, Vice President Bob Schumacher gave us a tour of the plant, where we met three of their apprentices, two young men and one young woman. One of the young men had graduated from high school before starting the program in the summer, and two are seniors this year. The young woman knew she wanted to be a welder when she started the program because her family has been employed in the manufacturing industry. He added, “We have 150 employees, but added 23 employees in the last six months and 40 in the last 18 months. We need to build a supply of future workers if we want to continue to grow. We have supported the robotics competition, For Inspiration & Recognition of Science & Technology (FIRST). For two weekends in January, we host more than 60 students from six local high school robotics teams to help them kick-start their FIRST Robotics Competition. After learning the theme of the competition, each team has just six weeks to design, build, and ship the robot to the FIRST national competition. We provide guidance from our mechanical engineers, electrical engineers, and project managers to assist students, their mentors, and coaches. Nick Piornack, business development manager, gave us a tour of two of the former textile mill buildings — one that has been re-purposed for offices and studio space, and the other as an apartment building. Between two of the apartment building is an outside event space where one of the finalists of The Voice was performing. There is one classic building yet to be redeveloped on the property. After the tour, we met with co-founder, Kayne Fisher, of Natty Green’s Kitchen + Market, who gave us a behind-the-scene tour of the restaurant. Fisher told us that he had dreamed of owning his own chop house and neighborhood market since childhood. So, when the opportunity to open a restaurant in the Carpenter's Shop at Revolution Mill came around, his brain-child came to life. The market included a butcher’s counter where you could buy cuts of meat the restaurant used in its menu. As a non-beer drinker, I actually enjoyed tasting a beer that had chocolate in it. Besides the usual steak, chicken, hamburgers, and salads, the menu offered pork chops, lamb chops, and braised brisket, the latter being my choice. All of our diners were delicious. At the end of a very fully day, it felt good to have seen the results of the redevelopment of an important industrial region with new industries, the re-purposing of old textile plants, and the creation of an apprenticeship program to foster the development of the next generation of manufacturing workers. ABCO Automation is an automation specialist for robotics, turnkey packaging lines, controls, custom-built equipment, assembly, material handling, inspection equipment, and build-to-print machines. Its customer base includes top-tier companies running round-the-clock operations that require high quality equipment and outstanding service. In the past three years, ABCO Automation has significantly expanded its workforce and opened a second facility in Greensboro. ABCO now has over 200,000 square feet of space. To qualify for the Mid-Market FAST 40 List, companies must be headquartered in North Carolina, be a commercial, for profit enterprise, be either privately owned or publicly traded, have a net annual revenue ranging from $10 million to $500 million, and have demonstrated sustained revenue and employment growth over the past three years. To qualify for the Business Journal’s Fast 50, companies must be a private, for-profit venture, have its U.S. headquarters in the Triad area, and must have finished three full fiscal years and had sales of at least $2 million in 2017. This is seventh time ABCO Automation has made the Fast 50 List. At the third annual mfgCON conference, Winston-Salem, NC, Brad Kemmerer presented “An Overview of Robotics in Manufacturing Today.” The presentation covered robotic applications, the movement toward flexible automation, operational benefits as well as how robotics can help United States manufacturing. With a decline in average product life cycles and an increase in the product mix, manufacturers are moving toward flexible automation as a solution for adapting to fluid production demands. Flexible automation allows manufacturers to quickly and easily re-task a system or equipment based on a product’s design. Automation software, robotic arms, and vision systems are some of the components that can be included in a flexible automation system. Robots are tools for successful United States manufacturing. From the years 1998 – 2013, the United States has seen a 40 percent increase of goods and services with no increase in required labor hours. Automation including robotics has played a key role in these productivity gains. According to the International Federation of Robotics, from 2010 – 2015 the United States automotive industry installed 80,000 new robots yet added 230,000 more employees. A robot may reduce costs and improve quality, but it also can raise productivity and the ability for companies to compete. This results in higher paying jobs, the prevention of plant closings (loss of jobs), production expansion, and higher total employment. North Carolina Commerce Secretary John E. Skvarla Recognizes ABCO Automation, Inc.
Commerce Secretary John E. Skvarla, III, presented ABCO Automation’s President Brad Kemmerer with Governor Pat McCrory’s Proclamation for North Carolina Manufacturing Week, in recognition of the company’s leadership and innovative workforce methods. ABCO Automation was selected to host Commerce Sec. Skvarla’s press conference as recognition of our business performance and our support of the Guilford Apprenticeship Partners. ABCO is a founding member of Guilford Apprenticeship Partners (GAP), a program developed to train students for an occupation by receiving a combination of classroom instruction and on-the-job training, working for manufacturers in Guilford, Randolph and Rockingham counties. GAP unites public schools, community colleges, NC Commerce’s Workforce Solutions, and local manufacturers to help students work toward a tuition-free Associates degree in industrial manufacturing and a Journeyman certificate. Upon completing the program, the apprentices are hired permanently by participating manufacturers. “One of the things that goes with growing very fast as a company is finding people to employ, people with the right skills and abilities to help us support that growth. We are concerned about finding those people, so we’re very much engaged in workforce development. That work, when done properly, is about a partnership between industry, education, and government. We’re very pleased to be a part of GAP.” Said Brad Kemmerer, president of ABCO Automation. For more information about GAP, please visit gapnc.org. Founded in 1977, ABCO Automation, Inc. designs, builds and supports high-end factory automation systems for manufacturers worldwide to improve the efficiencies and quality of our client’s operations. ABCO Automation is located in Greensboro, NC. For more information, visit goabco.com. ABCO Automation President & CEO Brad Kemmerer had the privilege of speaking to a fairly large group of students and staff at North Carolina A&T State University as part of The College of Engineering Dean's Distinguished Speaker Series. The series brings speakers from industry, government, and academia to North Carolina A&T State University to speak about innovative advances and approaches anchored in engineering and computer science. Read more about North Carolina A&T State University. Industrial automation is advancing rapidly for two main reasons: (1) Technology is racing forward, and (2) Manufacturers face an increasingly competitive global marketplace. If we want to succeed, then we must do so in the face of competition. This holds true for businesses, individuals and educational institutions. Change is the only thing that is constant, making continuous improvement and innovation absolutely necessary for long-term success. The competitive issues facing manufacturers are well known -­survival depends upon their ability to ensure or improve quality, reduce costs, achieve higher levels of throughput, eliminate dangerous or ergonomically-difficult jobs, and yes, innovate. I will share two examples of process innovations that I believe give ABCO a competitive advantage as well as the cultural enablers of innovation: Curiosity, Creativity, Collaboration, and Courage. It is my observation that when companies do something really different to excel in the marketplace, it is because some basic foundational pieces were present either in the leadership or the culture of the organization. As an automation supplier, we at ABCO, Inc., have always had to work hard to keep up with the state of the art to build competitive systems. This presentation will center on the synergies that have made ABCO Automation successful as a culture of innovation. ABCO designs and builds custom automation for manufacturers including assembly, packaging, material handling, and inspection equipment. These systems utilize robotics, machine vision, lasers and other advanced technologies. Kemmerer, a licensed PE in NC, earned a BS in Mechanical Engineering from Lafayette College and has held engineering and management positions at Richardson­-Vicks, Procter & Gamble, and ConvaTec in Greensboro. He joined ABCO Automation in 1991 to work on the design of a new fountain syrup plant for Coca-Cola. He became president of ABCO in 1999. With annual revenues of approximately $25 million, ABCO has around 120 employees, one-third of them being engineers. Kemmerer supports US FIRST Robotics as an engineering mentor and a judge at FRC events. He also supports United Way, The American Heart Association and Habitat for Humanity. He is married with two daughters, a son-in-law, and two grandchildren. Hobbies include reading, golf, and watching football. ABCO Automation is proud to support the FIRST Robotics Competition. Two weekends in January we hosted more than 60 students from six local high school robotics teams, helping them kick-start their 2016 FRC build season. To start things off, the kids learned about this year’s game, Stronghold. Each team has just 6 weeks to design, build, and ship the robot to the first competition. ABCO is committed to supporting all of the teams in our area, providing guidance from our mechanical engineers, electrical engineers, and project managers, assisting the students, their mentors, and coaches. FIRST Robotics is the most effective program we have seen for encouraging students to pursue an education and career in STEM fields, and we are excited to see the growth in the number of high schools with robotics teams. Our part manufacturing and machine building capabilities, along with the number of engineers we employ at ABCO, positions us as uniquely qualified to support these teams. On Sunday, the day after the game was unveiled, we reviewed engineering design fundamentals and led the students in game strategy, identifying desired robot capabilities, and began working on concepts that will allow their robot to do things like raise a portcullis or launch a boulder at their opponent’s castle. The following Saturday the teams returned for help in prototyping their concepts, designing in 3D, programming, and manufacturing parts for their robots. We provided a hot dog lunch for almost 100 people. January marks the start of another US FIRST Robotics competition. ABCO will once again be hosting multiple high school robotics teams in the afternoon on Sunday, January 10 and on Saturday, January 16. We had well over 50 students participate last year and was a great success! The teams only have 6 weeks to design, build, test, and ship their robots. ABCO will help the students strategize and conceptualize robot designs to meet the 2016 challenge unveiled just the day before. ABCO personnel, especially our engineers, will help the students during the brainstorming sessions. We'll also provide additional design assistance and support for prototyping and robot part manufacturing. ABCO is uniquely qualified to support the FIRST Robotics Competition. FIRST continues to grow and is the most effective program for stimulating interest in STEM education and careers. Our support has made a real difference helping the local teams to grow and do well in the competition. This year for the first time there will be a district competition in Greensboro, providing an opportunity to see results from our local teams. Check out www.usfirst.org for more information.